Sometimes I marvel at the magnitude of nonsense and garbage sold by the Seeker Friendly Industrial Complex to gullible churched folks every single day. I say churched instead of saved because that is the purpose driven language used and it more accurately reflects who we are talking about. People who will spend a great deal of time in church only to find out on the last day that they never knew Christ. Fully churched and fully unsaved. How else can you explain what churched folks believe? It is not just a spirit of deception beloved. It is a spirit of being deceived by the lowest common denominator. These deceptions are not even that intricate. How much discernment does one need to realize what is being peddled to them is complete gobbledygook? Holy laughter? Why in the world would anyone with the indwelt Holy Spirit believe the Spirit of God would want them laughing uncontrollably, rolling around on the floor, barking like a dog, and looking like a fool? Yet Holy Laughter took over much of the Charismatic churches for many years in America. That led to the demonic Brownsville Revival, where we were supposed to believe that the Holy Spirit caused people to have uncontrolled spasmodic muscle movements. Where is any of this baloney in the Bible? Todd Bentley was packing 15,000 people per night into tent revival meetings where he would punch, slap, and kick people to "impart healing" claiming the Holy Spirit instructed him to do so. Then you have the false signs and lying wonders network of churches led by Bethel and Bill Johnson. They claim such absurdly silly manifestation as gem stones, angel feathers or gold dust miraculously appearing for no particular reason during a service. Underneath these charlatans in the pyramid is an entire network of false prophets and prophetesses just trying to make a buck off of merchandising the sheep of the Lord. They pretend to run their own schools to teach you what the Bible says only the Spirit can give as He wills. They pretend to be in coalitions and networks to lend credibility to each other with official sounding and grandiose names; like the Council of Prophetic Elders or Shield. Yes the latest faux band of merry prophets are now calling themselves Shield. Perhaps they were trying to leverage the popularity of the Marvel Comic Books movie franchise. The shield is apparently made up of some of the top ranking heretical false prophets in the nation, including the likes of Chuck Pierce, Lou Engle and the General herself -- Cindy Jacobs. Joining this group of rank apostates is Charisma News' own crazy prophetess, Jennifer Leclaire. Jennifer is a rising charismatic star in false prophecy circles. She has a plumb assignment as editor at Charisma, which allows her a platform whenever she wants to spew her lies under the guise of thus sayeth the Lord. She just started her own school for prophets, which she charges $300 for and runs it out of a hotel room at the Fort Lauderdale Airport. She then created her own fake prophetic network where for another $300 you can join her club. She has an unhealthy obsession with the biblical character of Jezebel, worships this country and the Republican Party as icons, as well as an odd, unbiblical fetish for angels. While Jennifer did not say this directly, she thought enough about it to include it in her article revealing how utterly unbiblical and clueless she is when it comes to actual doctrine. Beloved, can I repent for your sins? Can you repent for mine? The obvious answer is no. Not only that but the Leclaires of the world confuse the theocracy of Israel with the state of America. Israel could theoretically sin against God because God was their leader. Thus they could repent. They had a history in Judah for example of righteous kings bringing the people back to only worship the true God. This country is not Israel beloved. It is not under covenant with God. It is a pagan nation filled with pagan unbelievers. We are also not under the Old Testament. Thus the people in this nation who are not believers are in the same boat as everyone else in the world. They will hear the Gospel and have to repent on their own or not. This repentance however is personal, not national. The false Christian leadership has led the church down a nationalistic, jingoistic path of worshiping the Sodom that we live in. It has trumped up social wedge issues into the only thing God cares about. But not everyone in this country is guilty of abortion for example. Even if they managed to outlaw it, everyone that was apart from God is still going to hell. Here we see the idolization of this country come into sharper view. Notice that Jennifer has concluded that the positions Trump holds on all of these secular, carnal issues are somehow the same God would want. Let's just look at one; immigration. Do you think that God is anti-immigration? Do you think that He would be for deportation breaking families up? Do you think that he would turn away refugees? What Gospel are you reading beloved? But preacher, there could be dangerous people there too. So what? Do we have faith or do we not have faith? Do we serve the creator of the universe or don't we? Are you prepared to stand before Christ and say that you would have liked to have clothed the naked and fed the hungry but you were afraid some of them might have been "bad" people? God doesn't care about the trade policies of the United States. He cares whether His church is preaching the uncompromised Gospel of Jesus Christ so that some might be saved before time runs out. Period. Really Jennifer. The Lord told you this? He told you He is releasing angels that are mentioned nowhere in the entire canon of Scripture? He told you that these angels are going to help transition the government into what you all have been praying for? I don't understand; what about the other angels you already told us God was releasing. You know; the ones you wrote an entire book about? Do the abundant harvest angels have to wait for the transition angels in order to complete their assignment? Shouldn't you have released the transition angels first? Does this mean the abundant harvest angels need to put their sickles away for now and wait patiently? Perhaps you should release the angels of clearing up confusion first. You have inspired me Jennifer. In response to this clarion call from Jennifer Leclaire I have travailed with God and He has given me a word to release on top of Jennifer's word. God has told me that He is releasing the angels of utter stupidity today to combat the wickedness of Jennifer's angelic release. These are a very special legion of angels reserved for when the level of apostasy and heresy gets so high and the stupidity so deep, that only these angels will do. There will be a shifting in the atmosphere as these angels seek out other fake angels and pummel them into submission. That's right Jennifer; my fake angels can beat up your fake angels. You pretended to release yours to further your politics but mine are released solely to destroy yours. 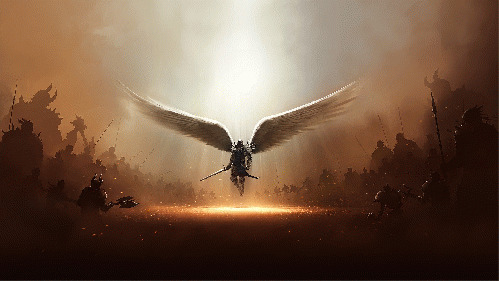 Oh and after they are done beating your fake angels of transition to a bloody pulp they are going after your fake angels of abundant harvest and take them out as well. I release you angels! Go fly! If that is the sort of thing you do! Seek out any utter stupidity committed in the name of Jesus and bring it forcibly back to the Gospel or eradicate it from this earth! Now now, before people get all upset remember that I am joking about something that does not exist. I am just using satire to point out the sheer ludicrous nature of what Jennifer Leclaire is declaring. Standing outside the Supreme Court does not make what she declared any more biblical. Now, angels are real beloved. They are mentioned throughout Scripture. They have assignments. They do protect. A lot of the imagery associated with angels is correct. What Jennifer does here however is wildly incorrect. God never told her something that is not in His Word. Think about how bizarre that notion would be! That our omnipotent, omniscient, and omnipresent God decided everything we needed to know in the Holy Scriptures but oopsie -- He forgot about those pesky angels of transition! Oh and how could He forget about those angels of abundant harvest! What's an all-powerful God to do? Good thing He has a direct connection to Jennifer Leclaire to bail him out. He can just tell her to write a book about it. This story is less plausible than Holy Laughter! Yet churched people throughout this country believe this nonsense. They believe that a group of unbiblical heretics standing outside of the Supreme Court can mean something to a Holy God other than the utter contempt He must hold for them. To then pretend that God spoke to you about releasing angels that do not exist for your own carnal purposes, which He has not ordained. But we do not have to fall for it beloved. We can discern. We can see something that is not in the Bible for what it is -- nonsense. But for every time the Jennifer Leclaires of the world try this tact; I will be there. This is only the warning shot. Next time I will release the angels of excessive buffoonery. After that I might have to let loose the angels of skylarking shenanigans. Don't push me Jennifer. Don't push me.